"This splendid compendium ... will be the standard reference work for years to come: a handbook to browse, to consult, to look things up in, and to read with pleasure, wonder and post-Darwinian exhilaration." "This is a marvellous book… It should be in every university library - preferably in several copies - and every reader of this journal should add it to their next grant application. It really is that good... 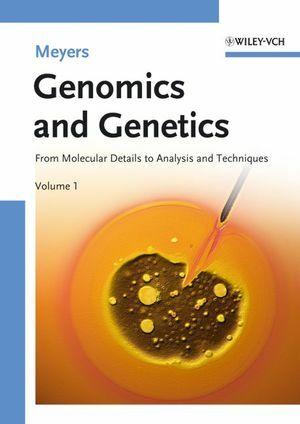 I have already found this book to be invaluable… For many years to come, these two volumes will be the starting point for anyone wishing to find out about virtually any subject relating to human genetics… Any scientist working on humans or other animals will find many things in these pages that will stimulate, inform and inspire. The authors, editors and publishers are to be congratulated for their work… order a copy now!" 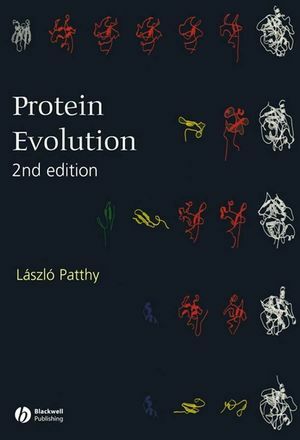 "The publishers and editors deserve to be congratulated for publishing this major book which coincides with the 200th anniversary of the birth of Charles Darwin. The book is well-timed, with biologists, theologians and sociologists engaged in intense debate on the Darwinian Theory on the origin of species, evolution and natural selection… There is little doubt that this marvellous publication should be in the library of universities and academic institutions dealing with basic and applied biology research and education… It will not be surprising if the individual academic or researcher decides to invest in this resource and enrich their personal collection of leading books in genetics and genomics." The revolution in human molecular genetics which has taken place over the last three decades has yielded a wealth of information not only on the structure and function of our genes, but also on gene expression, mutation and polymorphic variation. Over the last five years, the focus has moved from genes to genomes. Even though the annotation of our ~30,000 genes is still in progress, genome-wide studies have already yielded abundant evidence for the signatures of past selection and adaptive evolution within human gene sequences. Further, the completion of the sequencing of the 3 billion base-pair human genome, coupled with the increasing availability of other vertebrate genome sequences, has ushered in a new era of comparative genomics. We are now able to identify many of the molecular events (from the chromosomal level down to the single base-pair) that have occurred during vertebrate, mammalian, primate and hominid evolution. Indeed, the detailed comparison of the human and chimpanzee genomes has begun to reveal some of the genetic changes that have been involved in the development of human lineage-specific traits. We are thus acquiring the ability to ask searching questions about our origins, about the demographic processes associated with the global radiation of humankind, as well as some of the unique adaptations that make us human. This conceptual outline informed the selection of the chapters themselves and the connections between them. Some of these chapters are intended to be introductory, aimed at undergraduates and non-specialists. They provide basic information and a list of recommended further reading to encourage the reader to explore a topic in more depth. This approach helps the student reader progress from textbook material to primary literature. Some chapters are overviews that address topics of broad interest and importance, while others focus on quite specialized topics. These chapters are written for postgraduate students and research workers; they contain more detailed information and key references allowing the reader to investigate a specific area in more depth. This format allows professionals to use the books as a quick reference source. The chapters are richly supplied with website information to allow access to relevant data sources over the internet. The self-contained, peer-reviewed articles in this unique handbook have been written by leading scientists in each field. Key topics include the evolution of enzyme function, the use of nucleic acid divergence as a "molecular clock", the origin of non-functional or junk DNA, the role of gene duplication in the emergence of novel gene function and the identification of molecular changes responsible for various human characteristics especially those pertaining to infection, cognition, disease and disease susceptibility. 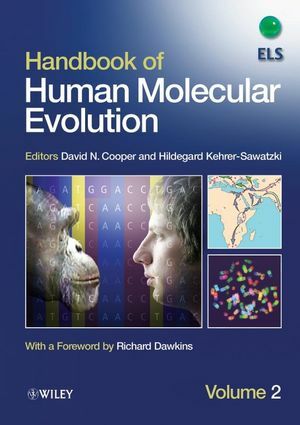 The Handbook of Human Molecular Evolution has adopted an integrated approach to the study of human evolution and seeks throughout to emphasize the interplay between molecular genetic concepts and principles on the one hand, and information acquisition and interpretation on the other. In this way, it is hoped that the ‘documents of evolutionary history’ written into the fabric of our genome, will become accessible to the widest possible audience. David N. Cooper has been Professor of Human Molecular Genetics at Cardiff University since 1996. His research interests focus largely on molecular mechanisms of mutagenesis and genotype-phenotype relationships in a variety of different inherited disorders, population genetics, gene expression, cancer genetics, growth hormone genetics, and molecular evolution. He has written or co-authored Human Gene Mutation (1993), The Molecular Genetics of Haemostasis and Its Inherited Disorders (1994), Venous Thrombosis: From Genes to Clinical Medicine (1997), Human Gene Evolution (1999) and The Molecular Genetics of Lung Cancer (2005). He has also co-edited The Functional Analysis of the Human Genome (1995), Gene Therapy (1996), Neurofibromatosis Type 1: From Genotype to Phenotype (1998) and Fascioscapulohumeral Muscular Dystrophy: Clinical Medicine and Molecular Cell Biology (2004). He acted as Editor-in-Chief of the Nature Encyclopedia of the Human Genome (2003) and is currently Editor of the Genetics & Disease section of the Wiley Encyclopedia of Life Sciences. He has been European Editor of the journal Human Genetics since 1997 and Curator of the Human Gene Mutation Database (www.hgmd.org) since 1996. Hildegard Kehrer Sawatzki is a Senior Research Fellow in the Institute of Human Genetics, University of Ulm, Germany where she has been a group leader since 2000. She has published extensively in the field of molecular medicine and molecular evolution. Alongside her long-term work on the tumour predisposition syndrome, type 1 neurofibromatosis, she has developed a keen interest in the comparative analysis of the human, chimpanzee and macaque genomes in order to identify inter-species genetic differences, particularly those which are human-specific. She has characterized, at the molecular level, the microscopically-visible chromosomal differences between human and chimpanzee known as pericentric inversions. In addition, she has performed detailed genomic comparisons which have contributed to the identification of the hundreds of small submicroscopic inversions, insertions, deletions and copy number differences that are largely responsible for the genetic divergence of the primates. In 2007, she received the Merckle Research Prize for her work on evolutionary and disease-associated chromosomal breakpoints. David Cooper and Hildegard Kehrer-Sawatzki are the ELS section editors for Genetics & Disease and Evolution & Diversity of Life, respectively.